Thank you for your wonderful recipes and books! I’ve been making 5-minute bread for several months. Now my daughter has been diagnosed with celiac so I’ve mixed up my first batch of your gluten-free recipe. In the written form of your recipe you give directions for baking in a Dutch oven yet in the video you bake on the stone. Can you tell me what the difference in outcome would be if I baked in a Dutch oven? Thank you! They are just two different ways to get a nice crust. Some people have a Dutch Oven, but not a stone, or the opposite. The Dutch Oven creates a great environment for a good crust. Thank you! I’ve been using the stone so will continue with that method! Happy Thanksgiving! I would like to make the gluten-free brioche, but is calls for milk and I am on the gluten-free AND casein-free diet. What would be the best substitute for milk? I can have soy, rice, almond, coconut or potato milk. Thank you so much! You can use soy, rice or almond milk for sure. I have not heard of anyone using coconut or potato, but it may be worth a try. I’d start with a small batch to make sure you like the flavor. I have been baking your bread since we moved to the States from Germany about 1.5 years ago. I just missed the bread from home and happened to find your master recipe on the web and since then I have been baking my own breads. And, I own both of your books. My husband and kids love it. Unfortunately, I just found out that I am allergic to yeast. Would you happen to have a recipe without yeast or gluten? I would very appreciate your help. I meant, yeast and gluten. Thank you for your quick response. I am actually allergic to brewers yeast and bakers yeast. There are some flatbreads, like roti, that don’t use any yeast. They are in our Pizza and Flatbread book. In your written version of this recipe you suggest pouring 1/3 of the oil and water at a time to keep the dough from getting lumpy.In the video you simply pour in all the liquid ingredients.Which way is best.I prefer the video but do not want lumpy bread. I am so excited to try your GF recipes. Lol…I love simplicity. I will try it video style.. These look wonderful! I’ve been a diagnosed celiac for over 10 years and so glad to find your recipes and video online. How does the large portion of cooked bread store? I live in Texas and don’t want to heat up my kitchen everyday for fresh bread, even though it would be terrific. If you don’t go through the loaf in a couple of days I would freeze it. My first attempt at the gluten free boule resulted in a wet dough with a weak rise. Ingredient quantities conformed to the recipe on page 236 in Healthy Bread in Five Minutes a Day. The dough’s supposed to be wet, that’s our method. But sometimes there’s too much of a good thing. We tested with Bob’s Red Mill GF flours; other brands may absorb water differently so you may need to adjust your flour amounts. Are you using xanthan gum? Have you checked your oven temp with something like http://ow.ly/8CVPU . If temp’s off you won’t get good oven spring. See our post which elaborates on some of what’s in the book, at http://artisanbreadinfive.com/2010/01/05/gluten-free-crusty-boule, and also another link to a video at http://artisanbreadinfive.com/2010/10/25/gluten-free-crusty-boule-the-video. You may be measuring may be faulty; GF flours are notoriously difficult. Pack the flour into the cup a little and your problem may resolve. You don’t have to do it in a pot the way we do on the website. Thanks for your feedback, Jeff. I’ll give your suggested changes a whirl and I’ll report back. We made your gluten-free crusty boule this weekend. We have a fantastic flatbread from the dough, but our boule was a little “dough-y” and dense. I am wondering if it didn’t rise enough because we used Ener-G egg replacer in the recipe. We are trying to eat vegan for the next month. What would you recommend for egg replacer? Anything else we could have done wrong? Elizabeth: We tested as it was written, so my guess is that the substitution is the problem… Did you see our post on egg-free at http://artisanbreadinfive.com/?p=1906 ? I am new to bread baking but since my son and husband were diagnosed with Celiac a year a go I am attempting it! I have made 2 batches of the GF brioche, both with excellent flavor and decent texture. I even made the Cinnamon rolls which were a huge hit! My question is that my bread does not seem to rise as much as I would expect. When sitting for the initial 2 hours it triples in size in my bucket, but when I put it in the pan to raise for the 40 minutes it doesn’t seem to rise much. So I end up with more of a banana bread size than a sandwich size. Any suggestions on what I may be doing wrong? Or do I maybe just need to use more dough for each loaf? I follow the recipe exactly. My dough does seem a little lumpier than what I see in your video. I’m stirring by hand but am going to buy a large stand mixer and see if that helps. Thanks for any info – my family LOVES the bread and had huge smiles on their faces the first time I served it. That is the nature of this dough, so filling the pan a bit more will be the ticket to a larger loaf. You will need to bake it longer to make sure it is set in the center. I discovered your site recently and have been thrilled to find your GF recipes. My copy of HBin5 just arrived and I’m making the GF brioche right now. My question is that the dough seems more like batter. I’ve made the boule and the dough was just like the video… I’ve never made brioche before (GF or otherwise). Is the batter-like consistency normal? Have you baked up a loaf yet? The g-f dough is nothing like traditional doughs, and this one is a bit softer than the g-f crusty boule. If it looks like the dough in my video, then you are probably spot on. I just ate a slice of the bread and OH MY GOODNESS it’s SO good!!! It (the dough) was moister than I’d expected but it rose beautifully and baked up amazing. I did learn that I keep my house too cool for the dough to rise so I ended up letting it rise in the garage. Thank you for this wonderful recipe. I make this every week! My variation is adding a layer of sea salt to the crust right before baking. I love your video, because it makes the whole process much less daunting. I have illustrated this recipe (including a little picture of you) for the site They Draw and Cook and of course I credited you and your site. Here is a link to the illustration in Flickr. What a wonderful illustration of the loaf! What fun. I have been baking gf since 1995..and breads were the scariest for me until I got my courage up to begin. 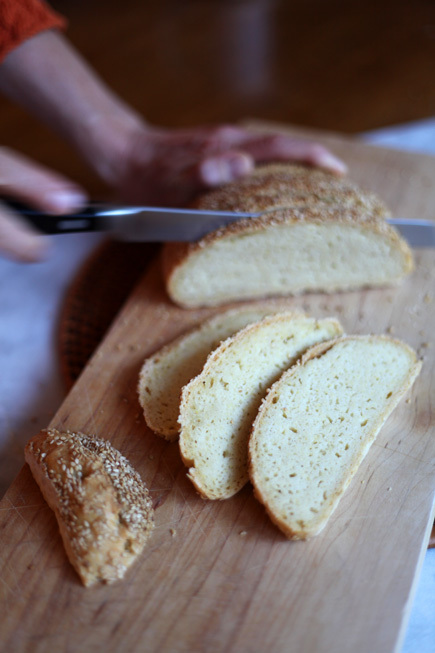 Now I teach people how easy gf breads are and how delicious and more nutritious they can be. Your technique intrigues me and I cannot wait to try it. The bread looks fantastic. Kudos to you both. I’ve started making your Gluten-free olive oil dough for a friend, but just found out she can’t handle eggs. SO! Can I use an egg substitute? If so, how much would I use? I noticed that all of your gluten-free breads have eggs in them, which I’m sure gives the nice crumb, but can you create one that does not have eggs in it? Or are we better off using the egg substitute? (would an egg-less gluten-free bread be not worth eating?). We absolutely love all of your breads and are looking forward to your new book that you are hinting at! I have used ground flax to replace the eggs: http://artisanbreadinfive.com/2010/06/01/gluten-free-baguettes-egg-free-and-a-king-arthur-gluten-free-flour-giveaway and some readers have used an egg replacer with good results. I’ll try that, thanks! Also in the gluten-free boule, it calls for sorghum flour, which I can’t find locally. What can I substitute for it? Would potato flour work? I think that potato flour absorbs water differently and won’t be a good substitute. The flavor will be different, but I think your best bet is brown rice flour. I’d make a half batch and make sure you’re happy. I also cannot find sorghum flour locally, so for the crusty boule I would just simply replace it by using more brown rice flour? I’m so excited to try this. I am not gluten free but several friends of mine have been diagnosed celiac and need some good bread in there lives! So happy I fell upon your site! Yes, this should work. It will not have the same exact flavor, but give it a try and see what you think. I would go with a half batch to start. Hi- our first try wasn’t successful and I think I suspect why but would appreciate some confirmation. When you mix the dough and then leave it on the counter, we waited 2 hours until refrigerating. I think, however, that the key might be to leave it out until it approximately doubles in size rather than to focus on the time. We leave our home a bit cool in the winter and the dough did not rise too much. We went ahead and blindly refrigerated it in exactly 2 hours and by now you have most likely surmised that we our result was suitable more for playing hockey than eating. So… C should we just have left it out for however long it took to double in size before refrigerating. Thanks!!! Yes, you can leave it out longer and see if the result is better. The only issue is that this dough has eggs in it so you don’t want to leave it out for more than 4 hours. You can also increase the resting time, once it is shaped, to see if that helps. When you mix the dough, be sure your water is warm and bringing the eggs to room temperature first can help the dough rise faster. You can just set the eggs in a bowl of warm water before cracking them into the recipe. Thanks Zoe for the quick reply. I do have a follow-up question. I have a proof setting on my oven. Would it be useful to proof the dough – either after the initial mixing or prior to baking? Thanks! Yes, you can certainly use the proof setting. Keep in mind that our resting times are based on a kitchen that is about 70°F, so if your proofer is set higher, keep a close eye on the dough so it doesn’t over proof. This is when the yeast does all of its work before it hits the oven, so there is no oven spring. I have used this dough recipe and love the flavor. But I’ve been having trouble with the dough resting for all 90 minutes. When I wait that long, the dough starts to flatten on the resting surface around the 60 minute mark, and by the time it’s ready to bake I have a loaf that’s not even 2 inches high. I’m trying to trouble shoot this problem – could it be that I’ve substituted xanthan gum with ground flax? Our family prefers to avoid the xanthan gum in baking, so I hope that this is not the reason for the mystery of the fallen loaf. Otherwise I follow the recipe exactly – temperature of water and eggs, quantity and kind of flours, everything is the same. I often have the dough rising initially near our wood stove; could the temperature be too high? Any advice is welcome! It is both the xanthan and the warm environment. First, try resting the dough for only 60 minutes, or as little as 45 minutes, or take it away from the stove and let it go the full amount. If that doesn’t help, then you may need to add some xanthan, which helps give the dough the strength it needs to rise properly. Thank you so much for your reply. I’ll try your suggestions. I was really excited to find this simple GF bread recipe that looks fantastic and is hopefully more cost effective than buying GF bread in the store all the time. I did try baking it for the first time yesterday and it came out tasting great with a nice crust, but pretty dense and heavy. Do you have any suggestions for troubleshooting? I may have baked it a few minutes less than suggested, but not long. Baking it longer may do the trick, I find that under baking g-f breads makes a big difference. I also have found that if I mix the dough in a stand mixer with the paddle attachment, it emulsifies the dough better and makes for a lighter loaf. If you have any dough left over and you have a stand mixer, give it a 1 minute mix and see if that makes a difference. Thanks. I will try letting it bake a little longer. I may also need to let it rest a bit longer after the loaf is formed, before baking it. I was also wondering how this recipe would work in a loaf pan. I would like to find a good sandwich bread. I’ve baked this dough successfully in a loaf pan, but you can’t make it too big or it comes out too dense. Also, be sure to let it bake longer or it may collapse when it comes out of the oven. Hi guys! I love your recipes! I’ve been making my own bread with success but now I found out I’m allergic to wheat but also rice! Do you have a gluten free recipe that doesn’t include rice flour ? Thank you! I discovered that I get into trouble if I just measure the big volume dry ingredients, so I weigh everything in grams. Follow the instructions in the video or book to mix, tho I have problems with lumpiness so may invest in a stand mixer. Bake on parchment with 1 C hot water in pan on rack above in beginning of cook. Thank you so much for this recipe I’ll give it a try! You’re welcome, I hope it works out for you. Hi, I tried your gluten-free recipe twice and it was so wet that it was difficult to handle and shape into a dough ball. I was just on Amazon and saw that they have King Arthur Gluten-free multi-purpose flour. Would it work if I were to use the ABin5 master recipe? Thanks. Kathy– haven’t tried that, but in general, I’d be skeptical about whether a 1:1 swap would work. Sounds like you just need to dry out the dough a little, just decrease the water slightly (or use extra flour, even now). Thanks, Jeff. I’ll try that first. That is fantastic, so glad it worked out and you enjoyed the bread. I will have to give the oat flour a try, I bet it tastes great. The addition of oat flour was not my idea. Someone else did it online and I can’t remember where I found it. I wish I could thank whomever it was, also. Hi, I was wondering if I could use white rice flour in place of the brown rice flour? Thanks!! This really is a great video – the level of detail is perfect and I found it very informative (Esp. the comparison’s between what can be expected with GF bread vs regular bread). Thanks! I bought your original bread in 5 book when I was still eating wheat. I’ve been wheat-free for a few years, and was happy to see your healthy bread in 5 had some gluten-free recipes. I’ve tried the boule and the olive oil both as a boule and a loaf with great success. I just now made the Brioche dough, and it’s much much more wet than the other two doughs. I’m pretty sure I measured correctly? It’s rising now – I hope it gets a little more body to it. Crossing my fingers. If the dough doesn’t develop more body after being refrigerated try throwing it in a stand mixer, if you have one. The dough comes together, but it does take a bit more effort to get the structure than the other doughs in the book. I love your original Artisan Bread book and have made lots of bread from it. My younger daughter has had great relief from several health issues since giving up gluten, so I was very excited for your new book. Like many others, I am really having no luck with getting the GF dough to rise. I made gluten-full dough with the same yeast and it is a mile high, so that’s not it. I weighed the flours to make your mix #1, used a Kitchenaide with paddle, left the dough in a warm -not hot- oven, and… nada. No perceptible rise initially nor in the pre-bake rest. I have made the Boule (p 64) which did have some oven spring and good flavor. It was a bit dense, but in her impatience for real bread, she ate it straight out of the oven. The Challah (p 210) was very dry – I had to add quite a bit of extra water to get the dough to come together – not at all like your usual. I used it for cinnamon rolls – no rise at all, not even oven spring. I’ll keep trying. Also, though, I wanted to say that I was very skeptical of using rice flour – everything we’ve used it for before has come out gritty. I am thinking the general moisture level and the storage of your method must be the magic here, because, for all that they don’t rise, the results are not gritty. Thanks for that – especially as rice is one of the more economical GF options. If your daughter is able to eat eggs, I suggest you try the egg white version of the Master recipe: http://artisanbreadinfive.com/2014/11/03/master-recipe-from-gluten-free-abin5 The extra protein in the dough really helps with the rise. Are you baking with xanthan or psyllium? What brand flours are you using? I’ve not had a similar problem with the challah, so I wonder if we’re using flours that absorb water differently? My wife and daughter are celiac so I’m always on a quest for good gluten-free recipes. Have you ever come across a recipe for a gluten-free, yeast-free crumpet? If so, would you be willing to share? The closest we have is a gluten-free English muffin in our Gluten Free Artisan Bread book. Could you offer an experimental recommendation substitute for yeast in either an English muffin or crumpet recipe? I’m excited to try your recipe & just bought the ingredients. However, I don’t own a pizza stone or a cast iron-enamel pot. I missed that part, when I watched the video. How would it affect the result to use a simple baking sheet lined with baking paper? Other suggestions? Thanks in advance. You can just preheat the baking pan, no paper and bake directly on that. The stone retains and conducts heat more efficiently, so it produces a great crust, but the baking sheet will help you get a nicer bottom crust.